Make the BETTER move now! Renting a moving truck (or van) is an easy way to move your home, office or even large pieces of furniture. With over 1,500 locations nationwide, Budget is at your service. 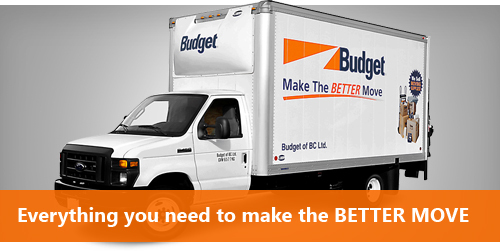 Using a self moving truck rental company—like Budget—is an affordable way to handle any move. This is especially true if you need to move one or two pieces of heavy furniture but do not own a truck (or van) of your own. Budget truck rentals also allow you to work on your own timetable and to move at your own convenience. Budget rental moving trucks include all of the comforts that you may expect from your personal vehicle. Each truck includes automatic transmission, power steering, power breaks, air conditioning, dual faced mirrors and FM/AM radio. A moving truck rental also features climate control systems to ensure protection for your belongings. These features are especially welcomed if you have a long drive ahead of you. Furthermore, if you are making a long distance move, Budget also makes GPS systems available for rent in both our cargo vans and trucks—to help ensure that you make it to your destination hassle-free. Size matters when it comes to moving. We offer a variety of moving trucks for rent in order to help you maximize you moving needs. In addition, our variety allows you to ensure that you do not waste money by getting a budget truck rental that is the wrong size. Our truck sizes include Cargo Vans or 10 foot moving trucks (suitable for 1 - 2 rooms), 16 foot moving trucks (suitable for 3 - 4 rooms), and 24 foot moving trucks (suitable for 5 - 8 rooms). Are you worried about choosing a truck that is either too big or too small: there is no need! Our representatives can help you out with that too: we want you to rent the right size so we will work with you to ensure the perfect fit when you rent a moving truck. As the name suggests, Budget is already a wallet-friendly means of relocating your household, your office, or anything else; however, we also offer discounts and promotions that can further discount our already low, competitive prices. Inquire with one of our helpful moving truck rental representatives when you make your reservation and we will be happy to tell you about our current offers. Budget rent a truck is simple. Your options are to fill out our online reservation form at iRelocate.net, or you can call and speak with a representative at 855-222-4281. When making a reservation, simply select the date you need the budget moving truck, where you will be picking up and dropping off the vehicle and what size vehicle best suits your needs.